Well, science fiction and fantasy friends, it’s that time again. If you’re a Hugo Awards voter/nominator (which is true is you were a member of the 2018 Worldcon or are buying your 2019 Worldcon membership), you have the power to nominate people for both the Hugo awards and the John W. Campbell award for Best New Writer. If you’re a member of SFWA, you can nominate for the Nebula awards. It’s the most nominate-iful time of the year! Because The Fall is set to release in 2019, I’m sadly not Best Novel eligible this year, but I’ve been very productive in the Best Fan Writer Hugo category with my ongoing column “A Place Where It Rains,” which features monthly on Luna Station Quarterly‘s blog. “A Place Where It Rains” focuses on sff storytelling — whether at the level of an individual story or product or at the level of craft — that really convinces the reader they’re in a place that’s “real” — a place where it could rain, as Italo Calvino said. My next Luna Station Quarterly column will drop on Monday, December 3rd, if you’re eager to see the content I’ll be wrapping up 2018 with. I’m also eligible for the John W. Campbell award for Best New Writer for The Nine, published in 2017. Both Best Fan Writers and the John W. Campbell award appear on the Hugo nominations ballot. I’d be much obliged if you’d consider me for either, or both — especially the Campbell, as this is my final opportunity to be considered for that award, and I’m really curious how I’d look with that tiara on. If you’d like to get eligible for the Hugo nominations and voting process, you can get your supporting membership to the 2019 Worldcon here. If YOU are eligible for a Nebula or Hugo award for work done in 2018, comment on this post with your name and links to your eligible works or your own eligibility post! Share this post with others in the sff community looking to broaden their signal and add themselves to reading lists at the end of this year! Good luck, everyone. I’ve read some great things from pros and fans alike and know we’ll all have a tough and wonderful time making up our minds. Fandom Doing Good: Thieves of Fate Tees Support the ACLU! Anyone who goes to sff cons with any regularity knows that packing for such an outing is an exercise in choosing your plumage. Is it the sort of gathering where you cosplay, and if so, should you invent something new, or break out an old standard? If it’s professional, how many stealth geek things can you work into an ensemble — galaxy necklaces, and dresses or ties with double-helix patterns, or what-have-you. Or maybe you’ve just got a dozen different comic, book, and movie t-shirts to choose from, and not enough days to wear them all. I’m here to say I’ve just complicated your lives more, con-goers. Oh, and non-con goers? This might get you to rethink your wardrobe, too. Custom Ink produces t-shirts for all kinds of events and groups, and now they make a Thieves of Fate character t-shirt, for a limited time, with an added feature of awesome: 100% of the proceeds from these shirts will be donated to the American Civil Liberties Union. It’s been said that it’s a bad idea for artists and creatives to get political, but that claim rests on a blinkered understanding of what art is. Everything is political, in some sense. You can’t tell me that I’m writing a dark fantasy series featuring a hegemonic religious and technological authority that’s abdicated all interest in the moral consequences of its doctrine and it ISN’T political. You can’t tell me that the world hanging on the fate of nine unknown persons — people we might easily disregard or destroy without a second thought, because life is so common, so cheap, so expendable — isn’t an observation of something at least a smidge Kantian, a trifle humanistic. My books are in the fight to make a better world, and so am I. So, I hope, is any reader who enjoys my writing and wants to share it with others. And I hope that’s the type of reader who would want to wear it, too. 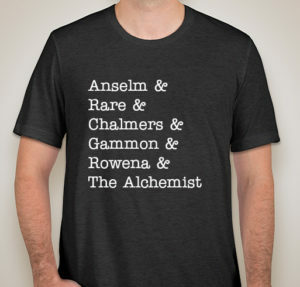 Custom Ink’s Thieves of Fate character tees are pretty awesome, if I do say so myself, featuring the names of the principle characters of the series: Anselm, Rare, Chalmers, Gammon, Rowena, and the Alchemist, a rogue’s gallery up and down. The shirts are available through November 29 in both women’s and unisex styles, with a handy size-checking tool that lets you actually see what the shirts look like on people of different sizes and body types! Each shirt costs $25, and each benefits the ACLU directly, down to the penny. So: ready to flesh out your con wardrobe? To buy someone a holiday gift to add to that pre-order of The Fall you’ve done? To wear something fun to your book club, to the library, the grocery store, to school? On casual Friday? Of course you do. 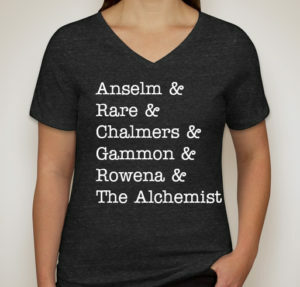 Here’s how to get it done: order your Thieves of Fate character tee here! My husband, David, called one evening in the fall of 2007 to ask if it would be okay to bring over “some guys” he had met at the local board game Meet-Up. He’d been going to the Bolingbrook Barnes & Noble for several weeks, sort of canvassing the gamers crowded shoulder-to-shoulder around its poorly-sized Starbucks cafe tables. The goal had been to find, through these neutral-location gatherings, a “safe” population of new gamer friends, ones he wouldn’t mind knowing where he lives and coming by regularly. (If you are a gamer, like us, be honest. You know this is a good plan. Not all of us are paragons of our kind.) That goal had become especially important as we had just had our first child a few months before and wanted desperately to maintain a social life, but also knew that getting out of the house to do it was going to become much harder. Shifting “going out” to “gathering a gang of people in our basement for weekend gaming, knowing they understood that sometimes, Tracy or David would have to dart off to attend to noises on the baby monitor” seemed the best course. I said yes, sure, jogging Tiny Corwin against my shoulder and cradling the phone in the other. Bring them by. “Do you want to know about them?” David asked. They appeared in a small group, all around the same time: John, an affable, articulate, handsome guy finishing pharmacy school. Hector, a wolfishly charming, acid-tongued statistician, to whom I owe the Alchemist’s habit of hanging his spectacles on his shirt collar. And, finally, Joe, whose tall, stoic composure concealed a curated lifetime supply of fart jokes, science fiction references, and puns. He was a nuclear regulatory inspector with the NRC, having cut his chops in nuclear tech through service on nuclear submarines. It worked out beautifully. We called the group (not without affection, though very much without tact) the Hobos, because their mutual bachelorhood, relative distance from family (Hector’s was down in Texas; John’s in Rockford, Illinois, and Joe’s peppered throughout the nation, with a cluster of them in the northwest suburbs), and regular appearance at our door made me into a kind of unexpected proprietor of a social club and soup kitchen for gamers. They would come over once, often twice, in a week, and I’d make a big dinner, and hop in and out of the less brain-burning games sandwiched between their weekend-destroyers. To help clarify to a growing Corwin, who needed some sense of who these people coming to his home constantly were, we called them the Evil Uncles. For a long time, we didn’t actually know Evil Uncle Joe’s name. He was “Puerto Rico Joe” because of his frankly terrifying ability to demolish anyone playing Puerto Rico while simultaneously playing another game over at a neighboring table, back in the Barnes & Noble days. Eventually, probably about three years after meeting him and a few hundred visits to our home, we got around to sheepishly asking for his name, so we could mail him something. I focus on Joe here not because John and Hector weren’t important — they were, and still are, though they’ve moved away and started new lives we periodically get to check into. I focus on Joe because last Wednesday, I was visiting him in hospice, wondering if it would be the last time I’d see him alive. Today, just one Wednesday later, I’m digging through my children’s closets for dress shoes that fit, because he is gone, and we are saying goodbye in the way people do, gathering and adjusting and sharing long, shell-shocked stares. One day when he was about seven, Corwin leaned in across the table to inform Evil Uncle Joe, “I know that rhyme, too,” and the silent look of understanding that passed between them was its own passage into proto-manhood. My novels wouldn’t exist without Joe. I wrote the first on something like a dare, and had no confidence in its value until I handed Joe part of the manuscript and asked if he would mind reading. Joe was a passionate lover of science fiction and fantasy, but he leaned much more heavily into sf, with Asimov and Clarke and Card ranking among his favorites. Their style wasn’t my style — not even slightly. But that was the point. If someone who had never wanted to read something like what I had created could want more, then maybe, just maybe . . . The next Saturday, Joe arrived on my doorstep with a smile, and the chunk of ms covered in markings. He asked if I had the next part ready. It is important to note that Joe was not a believer in polite lies. If you asked him anything directly, he would tell you his feelings directly. Not unkindly, but not with any bandying about, either. “Did you really like it?” I pressed. And that was what I needed. More than even what came next, Joe wanted the story of the world of The Nine itself: the Unity wars, and what the mercenary group was like when Leyah was still alive, and how Anselm lost his finger. He was hooked. But Joe was also there for me, always. When my mother died, and when the rejections on the novel kept flowing in, first from agents and then from editors. He played Small World with me and bought us all of the expansions as Christmas gifts even though he really didn’t like the game; he knew it was one of my favorites, and “Tracy gets to choose this one” was a mantra for him at a certain hour of any gaming evening I wasn’t swamped with writing or grading. After learning more about the school where I teach and the students there, he set up an automatic donation to our advancement fund — in no small amount — which hit every December, and was specifically ear-marked for the English department. “Found Family” isn’t just a trope. It’s a reality I’ve been fortunate to live. 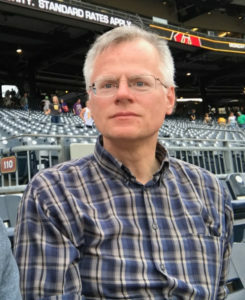 In the late summer of 2017, not too long after the picture shown with this post was taken (at PNC Park in Pittsburgh, where he stopped to meet my husband during our trip to the Nebula Award conference and rescue him from some hob-nobbing by catching a game), a two week period passed where we didn’t hear from Joe at all. This was, to say the least, highly unusual. He wasn’t answering his phone, or his texts, and though we knew him to be deeply private about personal affairs, he was never uncommunicative. He certainly wouldn’t have chosen to be, given the increasing pitch of distress in our inquiries. Finally, we got a text back. Been a bad few weeks. In the hospital. I’ll fill you in, it read, more or less. A few days later, it was Saturday, and he was back at our dining room table, looking yellow and tired and at least ten pounds lighter than he’d been just a few weeks before. Cancer. Liver, or maybe someplace else. It was hard to pin down the origin, given how the mass was distributed, and it wasn’t operable. Stage Four. The doctors had given him his odds, because they had to, and they weren’t good. He hadn’t been feeling entirely well in a few months, but had chalked his shortness of breath and low threshold for exhaustion to the fact that he was walking more for exercise and was probably just out of shape. Turns out, there was a baseball-to-softball-sized mass pressing right into his lungs. Joe kept coming every weekend his health didn’t absolutely prevent it, and our gaming table morphed around a kind of bucket list for him. Trying to play through Gloomhaven. Trying to defeat the undefeated Elder Gods of Arkham Horror and Eldritch Horror. Helping Corwin learn some of his first, really sophisticated games. He’d known the boy since he was only a few months old, after all. I don’t need to tell you what cancer does to a person. That’s all too well known, and all too visible — the whittling away, physically and emotionally. We saw it in steady increments, week by week, as chemotherapy worked and made progress . . . and then, eventually, didn’t. For Joe Maynen, my found family. You wanted what happened before and got the middle, instead. Now you have to stay for the end. I showed it to him before I emailed the manuscript back to my editor and agent. Joe was never one to be at a loss for words, but he was, at least for that moment. Sometimes, hope doesn’t pay off quite as you intended. Joe passed away on Saturday, October 20, a little less than three months before The Fall‘s January 15, 2019 release date, and decades before he should have done. I am grateful to my editor and all the staff at Pyr for working to get me a bound copy of the ARC as quickly as possible, so he could hold his book in his hands. He’d had it for about four weeks, and had memorized the dedication, reciting it to some of his visitors in hospital and hospice, by the end. He still had some notes on the manuscript — things he wasn’t a great fan of. All that kissing, for one thing. He was convinced it was in there because “publishing expects her to do that,” but the truth is, I just really wanted certain people to smash faces. Grief is a funny thing. There is a hole in my house around six feet tall. It sits in the chair beneath our matted print of Ward Shelley’s “The History of Science Fiction,” right below the curve where Babylon 5 and Space Operas whorl off to meld with Zelazny and Moorcock. It tells stories about the ship systems so critical to the functioning of a nuclear submarine that, if they give way, the ship must return to port for repairs, and how on Joe’s ship, the soft-serve ice cream machine was one of them. It asks me what I’m teaching my students in Speculative Fiction Studies this coming spring — or it would, but I can’t quite hear it, because it’s on the other side of a place I’m not meant to go yet, a place I want to pull it back from, so it can tickle my daughter and wrestle my dog and talk about the World Series with my husband. I’m not sure if any of us will sit in that chair. At least, not for a long time. Grief is a funny thing. So is hope. I’m working on the copy edits for The Fall now. If I’m going to change that dedication — make it clear that Joe won’t get to see how this story ends, after all — now is the time to do it. And I’ve decided I won’t. Those words mattered to Joe. They mattered enough that with what little energy he had left, he memorized them, and repeated them, and marveled at them. They are an artifact of an ambition we shared, something we wanted to make true by believing in it. In this small way, I’m going to make Joe stay to the end. It’s what I think he would want. It’s what I want. It’s the one thing left I can do. If you’d like to say thank-you to Joe – for being my friend, my family, my spur moving me forward – you can donate to the Wounded Warriors Project, in Joe’s name as a veteran, or the American Cancer Society, for the sake of others blindsided as he was. Space Unicorns Bring You… THE FALL! 1.) Is there a sequel coming? 2.) WHEN is the sequel coming? Good news, faithful readers! Both questions now have not only answers, but images to go with. 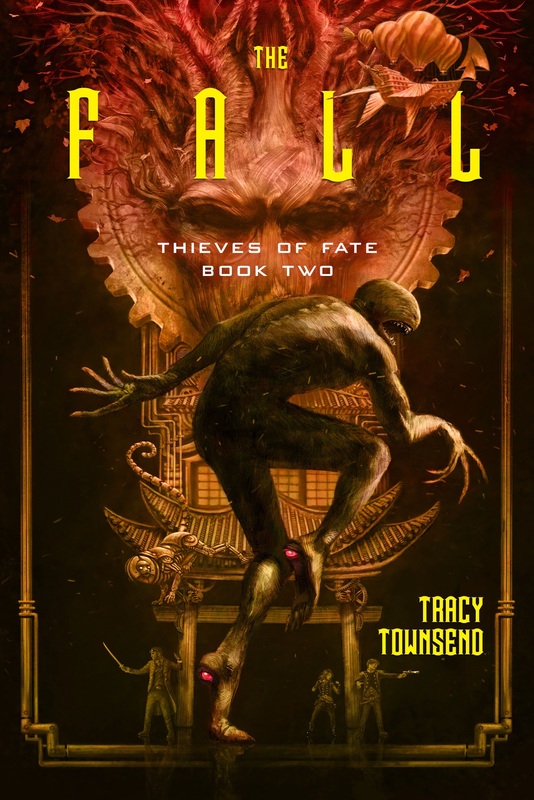 If you’ve been hungering for the next in the Thieves of Fate series, The Fall, it’s on its way to you January 15, 2019, and today you can see an exclusive cover reveal and teaser from it on Uncanny Magazine‘s blog! If you’re been thinking about getting a copy of The Nine and starting your Thieves of Fate journey, you can get one by posting a comment on the Uncanny cover reveal post with your idea for the strangest or most horrifying monster you can dream up… Or you can win by tweeting the same on the hashtag #uncannythefall. The contest closes at 11:59 PM, Central time, June 11! Drafting, revising, and revising again Book Two of the Thieves of Fate series! Paneling at ConFusion! And CapriCon! And giving workshops in writing and world building at local libraries! Starting my double-life as a columnist for Luna Station Quarterly with my monthly feature of building authentic relationships between audiences and texts through world-building, characterization, and general sf bad-assery. The feature title is owed to Italo Calvino, naturally: “A Place Where It Rains.” You can find my posts there monthly, with a new one dropping May 4 on the role of fanfic in reshaping mainstream storytelling methods! Hosting two of my favorite sf authors, Sam J. Miller and Amal El-Mohtar, for Skype sessions with my Speculative Fiction Studies Students. Welcoming the always-insightful and generous Michi Trota, Michael Damian Thomas, and Lynne Thomas of Uncanny Magazine to my school to speak about publishing anthologies and magazines in sff. Drafting the opening pages and synopsis of Book Three for my editor! Prepping for the Nebula Awards conference, where you can find me doing Office Hours once again on Friday, May 18 and taking part in the panel “We’re New Here,” where new and emerging sf authors talk about their experiences navigating the publishing world for the benefit of POSTERITY. If this sounds like a lot. . . well, it is. I’ve left out grading papers, writing report card comments, and the care and feeding of the Townsend Smalls as these activities continue at their usual pace. It’s really the pile-on of life as a working writer that makes the business hard rather than the business itself, I think. Since it’s been such a long time since I’ve posted an update and I owe you for your patience, I’d like to do something in return for you: comment on this post with what you’d like me to share on the blog next & I’ll enter you into a drawing for a copy of The Nine in audiobook! That’s right, thirteen actual CDs of Alyssa Bresnaham’s spectacular dramatic narration, autographed in a set! Hey, it’s almost as retro as vinyl these days. 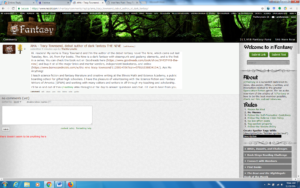 Only comments that follow the prompt above will be counted as entries. The comment contest for the audiobook starts now, and ends on May 4 at 11:59 PM. Why then? Because it’s Star Wars Day. And my son’s birthday. Final drafting and revisions of The Nine‘s as-yet-untitled sequel has commanded the lion’s share of my writing energy for the last month, meaning things have been quiet here on the blog. They haven’t been quiet, though, in the arranging travel and appearances department. 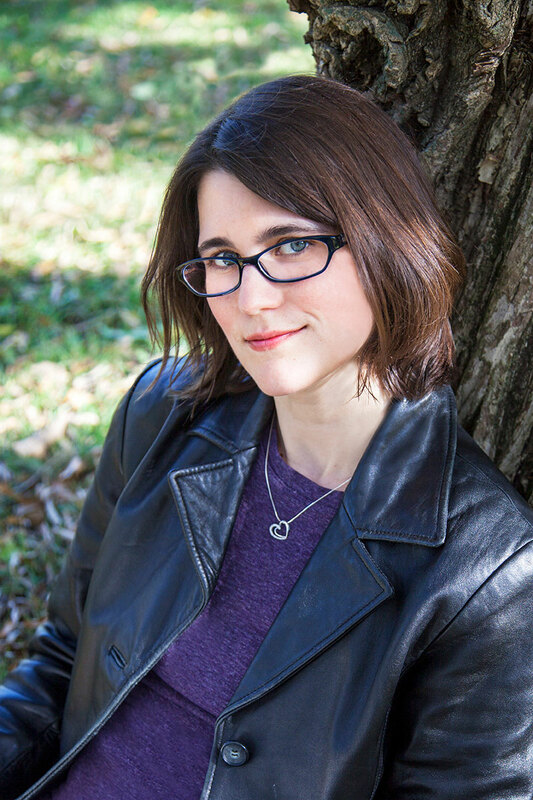 I’m kicking off 2018 with my first visits to ConFusion in Detroit and CapriCon in Wheeling, Illinois, quickly followed by a huge Johnson County Public Library event on writing and world-building for genre readers. You can learn the details of my schedule by checking my events page. Keep an eye out there for updates in the coming weeks as I finalize my late spring and summer travel plans. If you spend much time following the culture of sff, you probably know that the start of each year marks “awards season,” which is a bit of a misnomer, as there are so many awards from so many different cons and organizations, the process of nominating, reading, and voting for the best of sff can take up the lion’s share of the year from January to August. And so, around this time, writers, editors, and artists emerge from their burrows like Punxsutawney Phil spying for his shadow, sharing their awards eligibility posts. This year, I have the honor of being among them. I’m not generally a short story writer and am only just peeking my head into the world of related works writing through soon-to-be-inaugurated column with Luna Station Quarterly, “A Place Where It Rains.” (It’s an Italo Calvino reference, for those interested.) Thus, my singular offering (and a good one, I think) is my debut novel The Nine. r/Fantasy’s Best of 2017 Stabby Award (where it is already nominated for Best Debut Novel — you can vote for it just by logging in and upvoting its post! And as for me, personally? It is my great honor to at last be eligible for the John W. Campbell Award for Best New Writer. This one is particularly important to me because so many writers I love and admire have been nominated for it over the years — and many of my favorites didn’t win. To be nominated for a Campbell and lose would be a mighty achievement for me, indeed. I’d still feel as if I stood among giants. Ending up on the ballot for this award is my highest dream at this point in my career. I wouldn’t cry over a loss here in the least. I’d feel like I’d arrived. If you’re interested in reading The Nine, of course you can buy a copy using one of the many handy links on this website (it’s available in print, audio, and ebook formats), get a copy from your local library, or read excerpts from it on this website, or on Tor.com. You’ll also find several chapters of it in the upcoming Campbell eligibility anthology Event Horizon 2018. I hope you enjoy it, and hope you’ll give me your support if you do! If you’re part of my street team (still haven’t joined? why? don’t you like seeing cool stuff nobody else gets to see? — sign up for the newsletter at the top of this page!) then give me a boost by checking out these events, online or in person, and spreading the word about them. And if you’re not? Well. You’ll learn more than enough about me and my book to want to get in on the action. The Nine Days of The Nine Promo Schedule! Nov. 10-11: WindyCon 44 in Lombard, IL. – Friday the 10th I’ll be on a panel discussing currency and survival in a dystopian setting; Saturday, I’ll be on two other panels and giving a reading with prizes and giveaways for attendees. Check the events schedule entry for more details! Nov. 13 Lawrence M. Schoen’s Eating Authors & Anderson’s Bookshop Naperville, IL’s Pre-Release Sale & Signing: I’m very grateful to Hugo- and Nebula-nominated sff author Lawrence M. Schoen for inviting me to tell you about a favorite, formative meal on his “Eating Authors” blog series (a good entry to look up if you’re at all interested in my strange past in the martial arts). The night-before-release festivities continue in realspace, too, as I gather with friends, family, students, and perfect strangers for an exclusive pre-release sale of The Nine at Anderson’s Bookshop in Naperville. It’s never too late to order your copy and join in! Also, copies ordered online and shipped to you can be autographed. Just add in the comment box at checkout “I would like my copy signed” and place your order before November 13! November 14 is. . . RELEASE DAY!!! Nov. 14 Nicholas Kaufmann’s The Scariest Part: Many thanks to dark fantasy author Nicholas Kaufmann for welcoming me to his blog, where you’ll learn about facing the fear of being told you can’t have the villain you want in your book. . . . because they might be sympathetic after all. What happens when someone holding the strings to your future says that, and you still say no? Find out here! Nov. 15 John Scalzi’s The Big Idea: Every book idea comes from someplace. Hugo-Award winner John Scalzi is good enough to let me explain how pretending to be bad at my college work-study job yielded rewards I’d never imagined in my writing. Nov. 16 Mary Robinette Kowal’s My Favorite Bit: Mary Robinette Kowal may be one of the sweetest people in all of sff, so it’s no surprise that she opens her blog to authors who want to get excited with you about what they love in their work. On November 16, you’ll get to read about the one scene that survived every single edit The Nine went through, and why it survived unchanged to the very end. Nov. 17 Uncanny Magazine Blog: Publishing is a strange, complicated world and I’ve been fortunate to have an excellent support system of friends, family, and professionals around me. The Thomases of Uncanny Magazine are a little of all three to me. They’ve been kind enough to let me write about one of my favorite tropes — redemption arcs — but with a twist: writing as the author’s redemption arc. Nov. 21 Reddit r/fantasy Ask Me Anything: All cards on the table: I’m really not a Reddit kind of gal, so this one’s a bit scary. Still, there’s no more interesting place to go to get questions about your work and interface with readers than Reddit’s r/fantasy “Ask Me Anything” forum. Pop in to post a question, or to see my answers as they emerge Nov. 21st! Nov. 25 Small Business Saturday at Villains & Heroes Academy in Bolingbrook, IL: I’m a geek down to the marrow of my bones, and so Villains & Heroes Academy in Bolingbrook is exactly the kind of place I like to spend my time, and very much a place I wish I had had in my life as a kid. Fortunately, the Townsend kids are there every week for games, comics, and general geekery. Now you can support a big-hearted small business and buy a copy of The Nine from me. Gifts, swag, and giveaways for all comers will be there, too. Nov. 30 Chuck Wendig’s Terribleminds.com “The Five Things I Learned Writing The Nine“: You’d have a hard time identifying a more colorful author or blogger than Chuck Wendig. His “Five Things I Learned Writing. . .” series is the perfect home for other authors to share their most colorful experiences writing, too. The list could go a lot longer than five, in my case. But I had to be good and obey the rules. And there it is! A first taste of the many places you can go to keep up with me. More to come in the weeks to come, of course. If you have any suggestions of where you’d like to see me — in real life or virtual life — make a suggestion in the comments below. Starting November Big: Amazon & Tor & Release Week News! The Nine is an Amazon Editors’ Pick for Best Science Fiction and Fantasy in November! And if that wasn’t a big enough way to have kicked off the month (including, ahem, a sprint to the end of NaNoWriMo with Book Two in the works), Tor.com hosted a teaser from the novel — a chapter you can’t find anywhere else (or at least, not until November 14). Moreover, a brand-new review from Books, Bones, & Buffy came out this morning, and to say it’s glowing is. . . kind of an understatement? Well, I’m glowing, anyway. Keep your eye out for “The Nine Days of The Nine” in November, starting November 10 at WindyCon 44 where I’ll be doing a reading from The Nine, a giveaway of the final ARCs and the much-beloved Thieves of Fate Fan Packs (complete with character-themed tea, notebooks, bookmarks, and of course the custom-designed Stone Scales tote bag by Mike Dean) and joining panels Friday and Saturday on everything from tropes of bygone sff to survival in the crapsack dystopia. Join me here for the full schedule reveal of the “The Nine Days of The Nine” this Wednesday so you’ll know where I’ll be in real life and digitally. I’d love to “see you” at all the stops along the way!